An odd month with warm spells at the beginning but much cold northerly weather from mid-month onwards.. The total of just 80 species compares with an average of 85.5 over the previous ten years. The month started well with five of the expected migrants, i.e Hobby, Greenshank, Little Tern, Turtle Dove and Reed Warbler, seen but no sign of a Garden Warbler or Spotted Flycatcher. Bird of the month was undoubtedly the Cattle Egret on 5th whilst our first Merlin of the year, on 3rd, was unexpected. 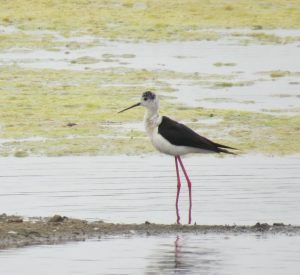 However, the second half of the month was dire with five Avocets appearing out of the gloom on 26th, the only other addition to the year list. 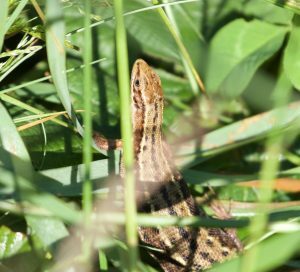 Despite all this, the total of species for the year is now three ahead of that at the same time in 2017. Sunny, warm with a light NE wind. A struggle this morning with one Gannet and one Shelduck west and two Swifts, three Sand Martins and four Swallows also west whilst a single House Martin was hawking over the area. 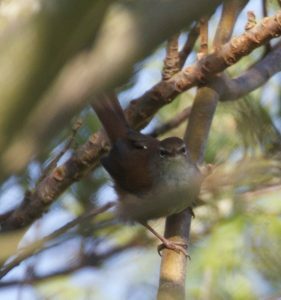 Our second ever Cetti’s Warbler was present for its 38th day! 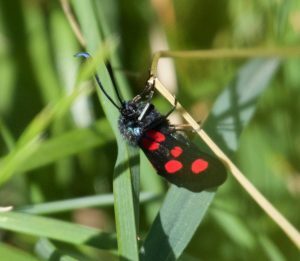 A Red Admiral at the Obs was the first since one recorded by Andy during the winter months. Cloudy and misty and warm when the sun broke through. Early morning conditions favoured a few migrant waders with a party of five Avocets calling and eventually emerging from the mist as they flew on west (our first this year). Also two Dunlin and three Ringed Plovers (probably migrants) flew east along the beach and two Turnstones flew west. 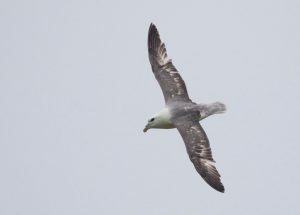 Over the sea, 57 Gannets, including one party of 26, flew east (our highest count this year) and an adult Kittiwake also flew west. An immature Mute Swan flew east over the Obs and then flew back west and there were eight Great Black-backed Gulls (two adults and six immatures of various ages) on the beach (a high count for this time of the year. 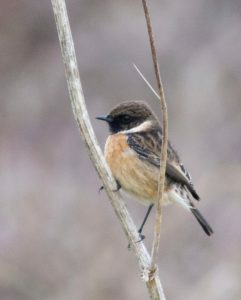 Other migrants included six Swallows west and two Reed Warblers singing, along the east bank and in the Scout Wood. Sadly, there is as yet no evidence of the new notice boards having any affect on disturbance on the beach. Today, this included a lady, with dog of course, painstakingly collecting rubbish on the shingle ridge at high tide. Cloudy with a light NE wind. 13 Gannets flew east and a party of four Grey Plovers flying east close inshore were the first this month. Swifts continue to be uncommonly scarce with only two noted today. Holly Blue and Small White were the only butterflies seen today. Cloudy with a shower of rain and light northerly winds. Three Sandwich Terns feeding close inshore unusually included a second year bird (usually they remain in the winter quarters of West Africa). 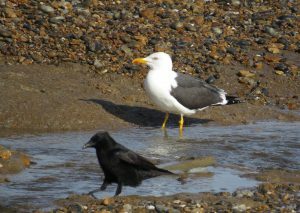 Two Turnstones were on the beach and the resident Carrion Crow flock numbered 64 birds. Cloudy, light NE wind and cool. A better day in comparison with the poor standards of recent times. Five Gannets and five Common Scoters flew west. 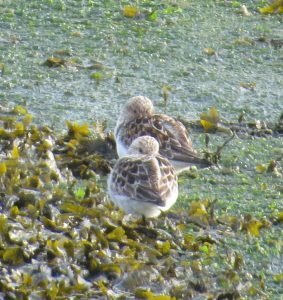 A Greenshank was heard calling and two Sanderlings (the first this month) and five Turnstones were on the “slipway” at the eastern end of the beach. Eight Swallows and a Yellow Wagtail flew west and a Reed Warbler was singing in the bushes opposite the Obs. Sunny with a light NE wind, warmer. Remains quiet, very quiet. 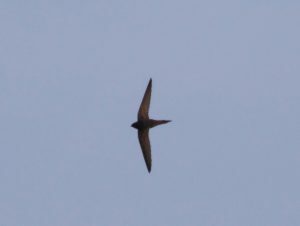 There were four Swifts hunting over the area early morning. A Whimbrel flew west and two Lapwings, the first since March, circled over the Marsh Pool then drifted off inland. A Song Thrush was videod as it smashed and ate a snail along the coastal path. Cloudy, moderate NE wind and again cool. After a period of quiet warm weather, we now have a period of quiet cold weather. Five Shelduck flew east whilst a single Turnstone was the first seen here for a week. The notice boards ask that people avoid the area marked “sensitive” which is the beach. Today, there was a party of 55 school children on the beach wielding red and white poles and tape! Cloudy with a fresh northerly wind and cool. Ten Gannets flew east over the sea and a party of five Mediterranean Gulls (four adults) flew east over the area. Vis mig was limited to hirundines with one Sand Martin, 43 Swallows and five House Martins flying west. A Reed Warbler, singing in the depths of the east bank, was our second this year as was a Turtle Dove heading south, seen by Arnie van Orsouw in the afternoon. Three notice boards, many years in the gestation, have finally materialised. 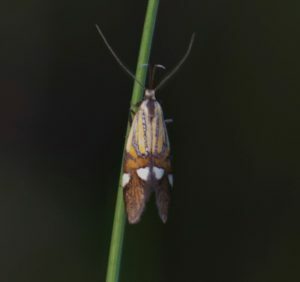 They look good, they are more substantial than previous versions which had a tendency to unexplained disappearance, and so will hopefully remain longer. They are quite informative but I fear the appeals to more “sensitive” behaviour may go unheard. Light cloud with a fresh, cooling northerly wind. Not a pleasant morning. Four Gannets flew east and 27 flew west. Some vis mig with seven Swifts, 82 Swallows and four Yellow Wagtails heading west. Unusually, no Turnstones were seen for the second visit; more usually a few remain throughout the summer. Sunny with a light SW wind. 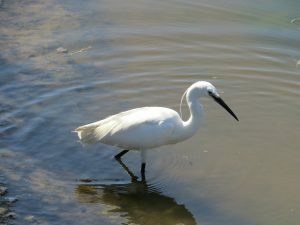 Two Great Crested Grebes were offshore, four Shelducks flew west and a Little Egret was on the beach, then roosting along the east bank and then on the Marsh Pool. 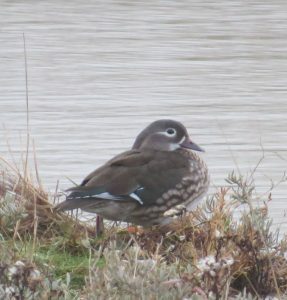 Waders were scarce with two Oystercatchers and two Ringed Plovers but no sign of any Turnstones. 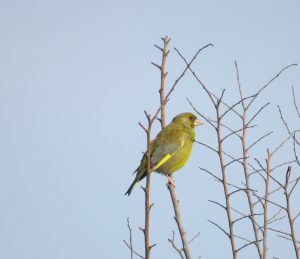 Not a vis mig day but a flock of six Collared Doves appeared to be in a hurry heading west and there were two Swallows and three Goldfinches also on the move. Two House Martins were back at the remnant brook presumably in search of mud for their nest. Sunny with a moderate southerly wind. 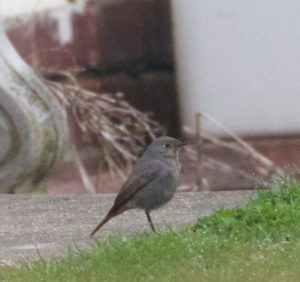 This had all the makings of another quiet day but two additions to the year list were welcome if not unexpected. Firstly, a Hobby flipped over the east bank and flew low across the football pitch heading east. 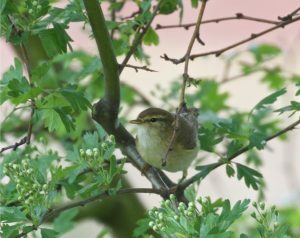 Secondly, a Reed Warbler was singing in the trees by the Obs and showed well briefly. 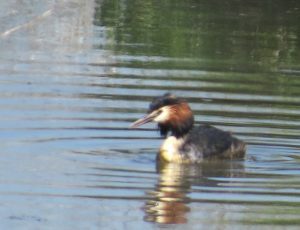 Out over the sea, five Gannets circled distantly, a Shelduck flew east and there were two Great Crested Grebes offshore. It was a good morning for raptors with, as well as the Hobby, a Red Kite flying west over the sea at 9.40 am and a very pale Common Buzzard flying west over the area at 10.55 am. 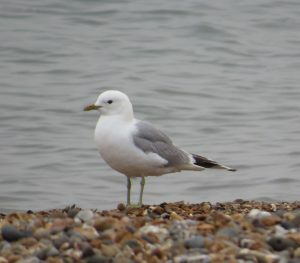 Waders were limited to the ever present Oystercatcher, Ringed Plover and Turnstone and a few Sandwich Terns flew east. Vis mig was minimal; three Swallows, a Sand Martin and two Rooks flew west and there were also two local House Martins in search of nesting material. 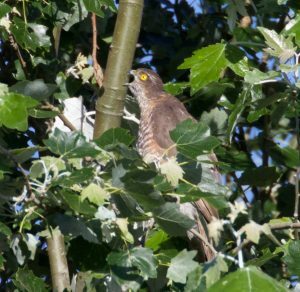 The hepatic female Cuckoo appeared in the scrub and the Cetti’s Warbler was present for its 21st day. Ted was on duty again today. The three Turnstones were still present but there were no other waders of any note. More vis mig, however, with seven Swifts, 125 Swallows, five House Martins and three Yellow Wagtails west. 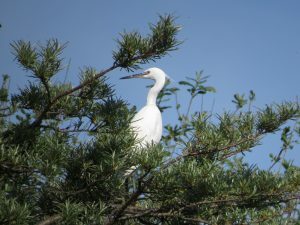 Ted Lee saw two Little Egrets, three Turnstones and a Common Tern. Two Swallows and three Yellow Wagtails flew west. Sunny, calm and very warm. There were two Great Crested Grebes offshore, two Gannets flew east, a drake Gadwall flew west, a few Sandwich Terns flew east but the highlight of the day was three Little Terns which flew east mid-morning. Only just about annual in occurrence in recent years. 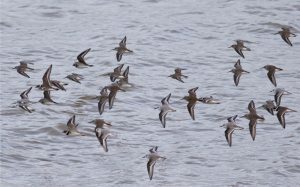 Waders were scarce with only six Turnstones remaining but there was another flock of 60 Black-tailed Godwits which (as on 5th) flew high east. 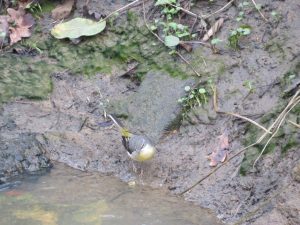 A Cuckoo flew west and a few Swallows and four Yellow Wagtails also. 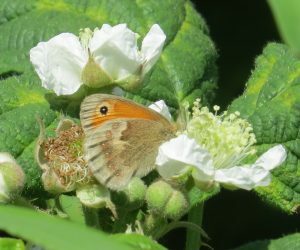 Butterflies included Speckled Wood and Holly Blue and a female Orange-tip which often go overlooked. A Brimstone moth also flew by the Obs. Finally, on its 17th day, the Cetti’s Warbler showed well enough at the Obs for Andy to get a record shot. 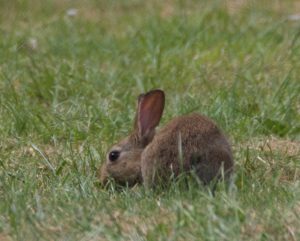 Andy bravely ignored the obvious downsides of a hot, Bank Holiday Sunday morning. He was rewarded with a flock of five Common Sandpipers, flushed from the beach by a dog walker, and heard two Greenshanks calling ( new for the year). 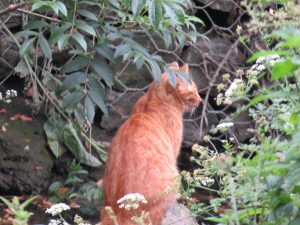 He then beat a hasty retreat. Sunny, calm and warm with just a little cooling onshore breeze. 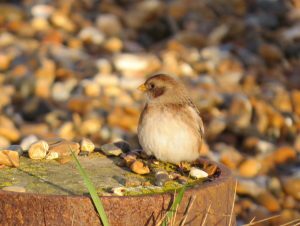 Andy’s reward for an early start was a new bird for the site. 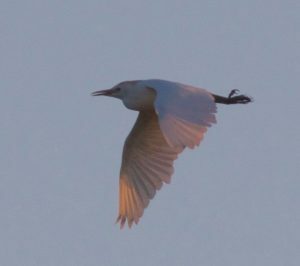 A Cattle Egret circled over the area at 5.35 am, decided on balance not to land, and headed off SE. Anything after that was likely to be an anti-climax but a flock of 70 Black-tailed Godwits flying high and east was not only a new species for the year but our highest ever count here. 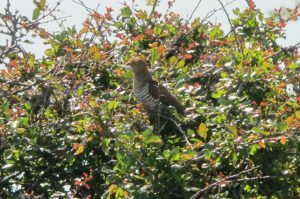 Also, it was good to welcome back a hepatic Cuckoo for her third year. She mooched about the scrub for a bit before flying off west in front of the obs. Otherwise it was very quiet. 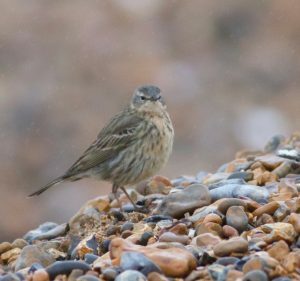 A few Sandwich Terns and a Common Tern were the first for a week, a few Swallows flew west, a Skylark rested briefly on the shingle ridge. 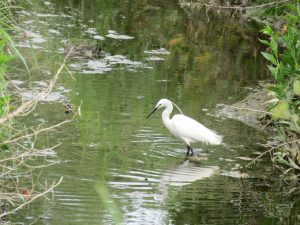 The Cattle Egret was the 245th species recorded here since 1990 and, after Citrine Wagtail last October and Melodious Warbler last May, the third addition in less than a year, i.e. above average for recent years. Sunny, calm and warm. There was one Great Crested Grebe on the sea, three adult Gannets flew west, two Mute Swans flew west an seven Shelducks flew east. A Cuckoo was calling in the sewage works and then flew east across the area and beyond. A little vis mig ealy morning included three Sand Martins, 32 Swallows and a Yellow Wagtail. One male Wheatear was on the shingle ridge whilst a flock of nine Jackdaws, flying south over the football pitch, was unusual. Sunny, light westerly wind, warmer. What seemed a fairly quiet morning did produce two new birds for the year. Firstly, a Merlin (not the most expected falcon addition at this time of the year) flew low over the estate at c8.30 am and then, presumably the same bird, flew east across the area at 10.10 am. Secondly, a Turtle Dove starting “purring” from the sewage works behind the Obs at about 11 am. It was out of sight save for a brief appearance in display flight. There was a modicum of vis mig with one Swift, 24 Sand Martins, 94 Swallows, five House Martins, three Yellow Wagtails, 15 Goldfinches and four Linnets flying west. 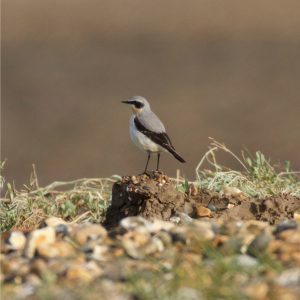 Two Wheatears were again on the shingle ridge. 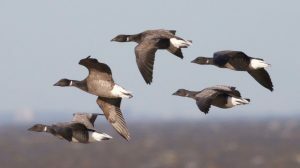 One Great Crested Grebe was on the sea, two Greylag Geese paused briefly offshore by the Obs and two Brent Geese flew west close inshore. One Whimbrel flew west. Sunny with a moderate westerly wind. A relief after yesterday’s winds and heavy rain. 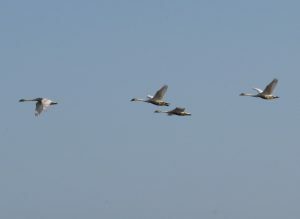 One Great Crested Grebe was on the sea, an adult Mute Swan flew east and two Whimbrel flew west. Vis mig included one Swift, two Sand Martins, 55 Swallows, two House Martins, 15 Yellow Wagtails, 106 Goldfinches and 18 Linnets. 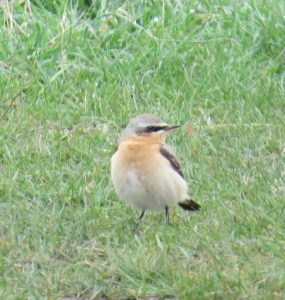 There were two Wheatears, a male and a female, on the shingle ridge and a Willow Warbler along the east bank. Good to hear that the Cetti’s Warbler has made it into the new month. 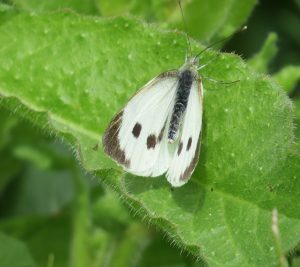 Butterflies seen were Green-veined and Small Whites, Speckled Wood and Orange-tip.